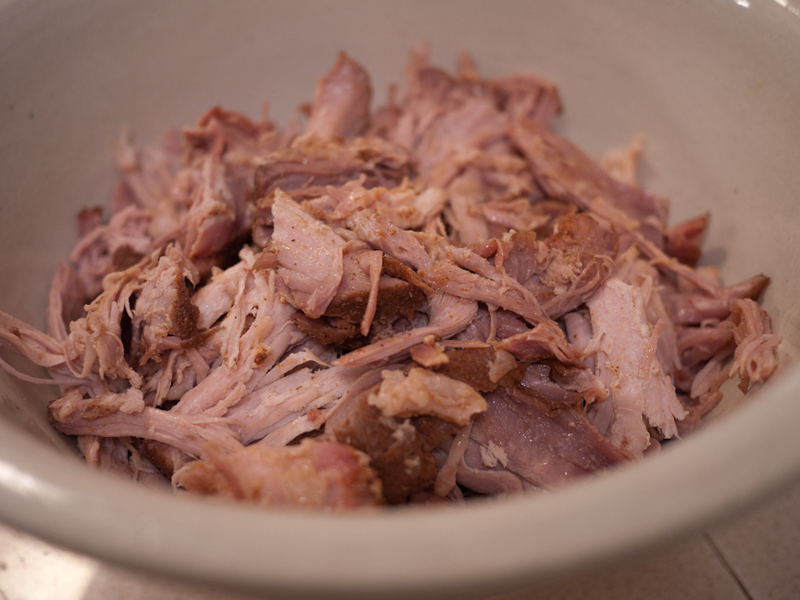 Pork Shoulder; The Good, The Bad, and The Ugly (and why the ugly way might be the best of all). Pulled pork. 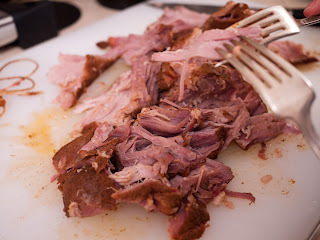 Nothing gets barbeque guys, pit masters, or smoke hounds' juices flowing and mouths watering quite like a luscious, rich, fatty pig shoulder slowly cooked for hours over low heat. Slow and low baby, that's what it's all about. I recently went to a locally well regarded place (A16) best known for their pizza. I had tried to get a table there three times previous and never even could get to the bar. The night I was there, they were running a pork shoulder special. We squeaked in, arriving just before the doors opened at 5:30 on a Thursday. The place was packed by 5:45. The wine was good, and the ambiance was better. I figured I'm finally here and I'm going for the full experience. When the shoulder arrived I couldn't have been more disappointed. The cut of meat was tough and leathery, webbed together by elastic, stringy fat and connective tissue. After the meal as we left, I stopped and asked one of the kitchen staff how they'd cooked the shoulder special. She told me they cooked it for an hour at 400 degrees. This is not the way to prepare swine staddle. No thanks, next time I'll stick with the (stellar) pizza. 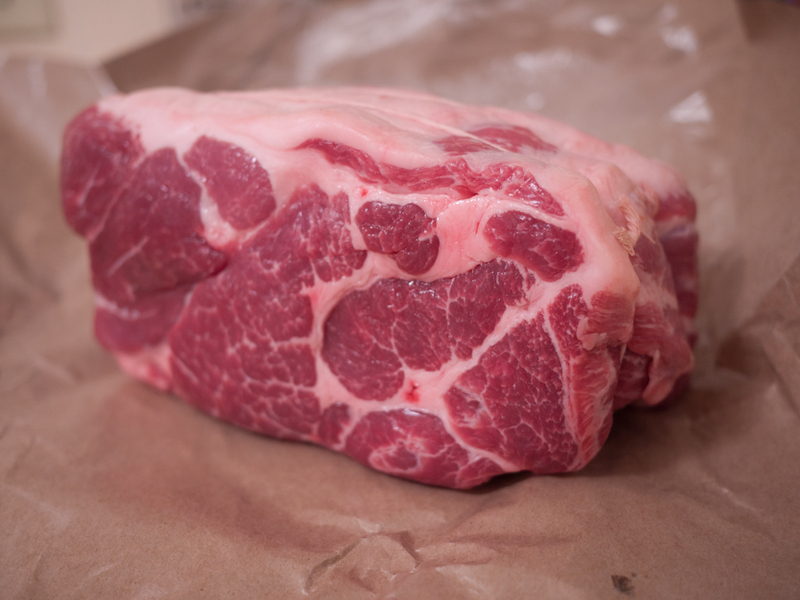 The shoulder can be tough cut of meat due to the high amount of connective tissue and fat. 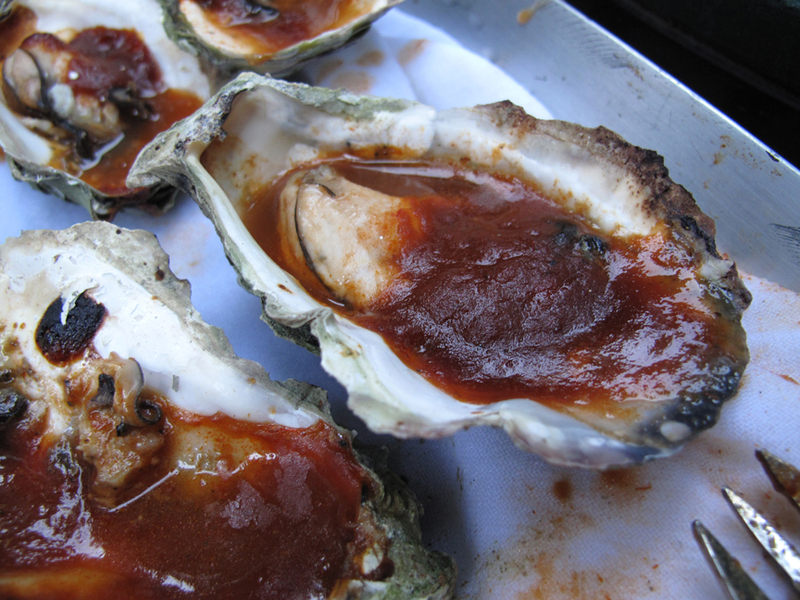 These qualities also make the meat very flavorful and moist when prepared correctly. 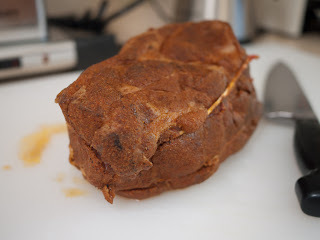 Pork shoulder typically, I think probably, should be cooked to an internal temperature of 140°-160°F for 12 to 24 hours, in some cases longer. This will dissolve the connective tissue into gelatin and give you tender meat. I've cooked more than a few pork shoulders the good, old fashioned way in my trusty Big Green Egg. 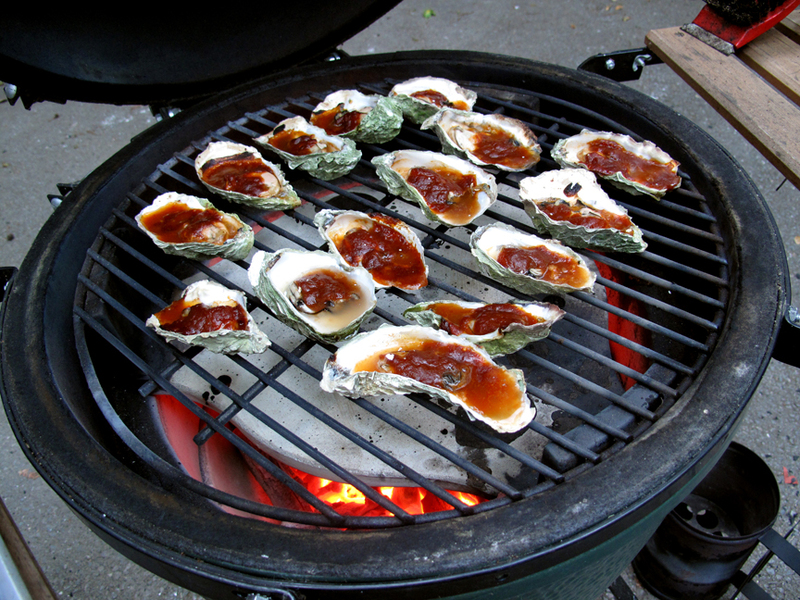 First, let me tell you that I love my big green egg. 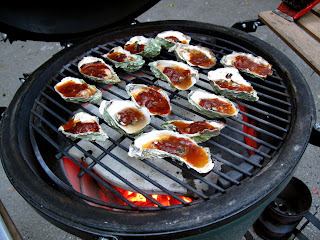 For those of you uninitiated into the wonders of the glorious BGE, let me explain. The BGE is a ceramic bbq/smoker. The ceramic construction is very efficient. It absorbs and holds in the heat as opposed to a steel cooker that radiates. The lid and body seal tightly. You control the temperature by manipulating two air dampers. Once you get the egg warm and you get to the temperature you want, the design of the egg keeps a very stable temperature and it cooks the hell out of anything. I can't think of a way to cook that is better. Cooking with a BGE is like playing a violin. I like, no I love the egg so much, I own three of the things. There are a few caveats to eggery however. You have to pay attention to what you are doing to insure there are no temperature spikes or fluctuations, you may have to add more fuel, which means taking everything out from the top, hot and cumbersome, and the thing sends up more smoke (initially anyways) than Mt. Vesuvius which makes my neighbors act like little, Pompeian, Gladys Kravitzes. In the interest of apartment building harmony I use my beloved eggs as sparingly as possible. 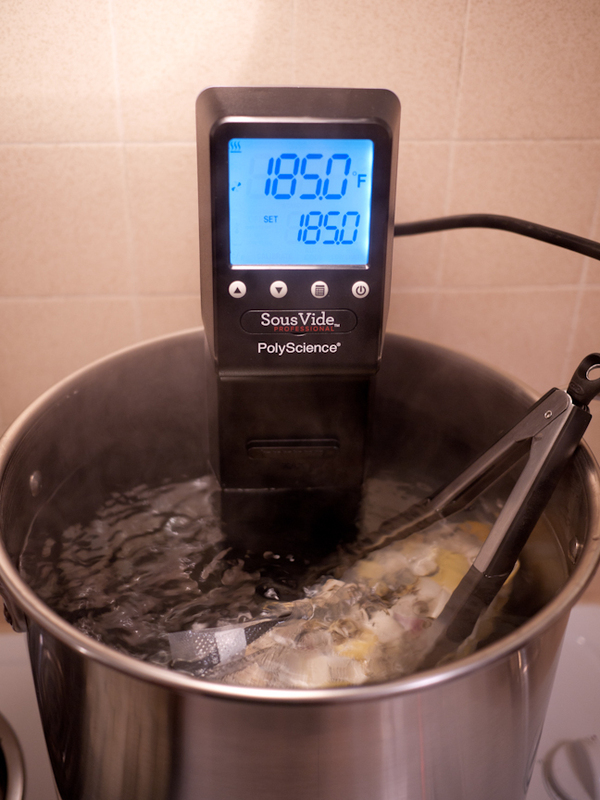 This seems like a good opportunity to employ my new go to guy, the sous vide circulator. I am totally digging the sous vide method. 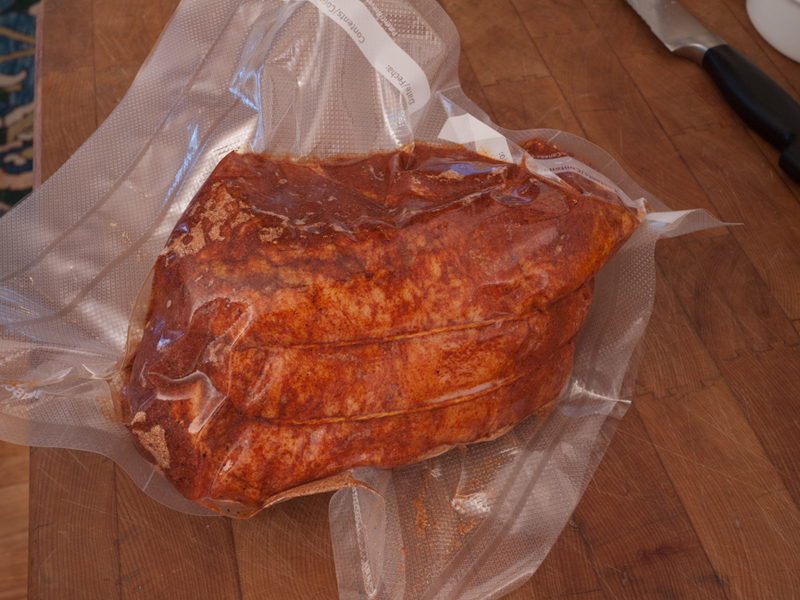 Sous vide is french for "under vacuum" and refers to the way you prepare whatever it is you're fixing by first vacuum sealing in it in a plastic bag. You then take the package and cook it in a water bath. The water bath can be kept at precisely the temperature you desire for as long as you want. 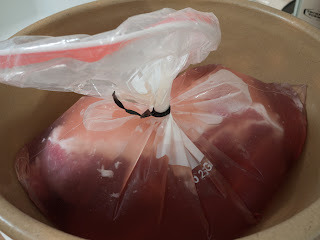 By keeping your food, in this case our delicious little strut of hog, securely enveloped in the blanket-like swirling waters, it cooks gently and uniformly. 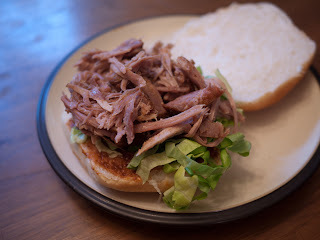 Using the Sous vide method, food is basically poached and can not be overcooked. By virtue of being vacuum sealed, the object of your culinary intent cooks in its own juices which do not evaporate and well, you can imagine how tender and lush this is. Meat or vegetables braised in their own juices, cooked to the perfect temperature, every time... Mmmm! First, I started with an overnight brine consisting of 1 liter of water, 10% salt and 3% sugar (100 grams salt and 30 grams sugar) in the refrigerator. This is the only brine I really ever use. I've never been able to taste any benefit by adding booze, coriander, or anything else. KISS! 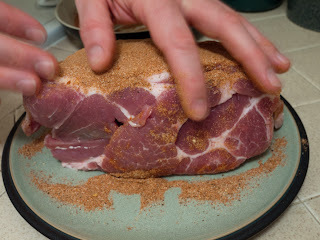 The following day I prepared a rub, just like I would if I was doing the shoulder traditionally. 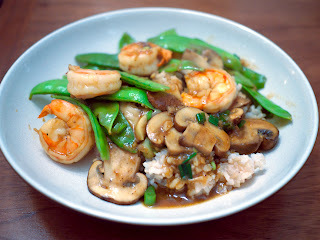 I've been reading David Chang's great cookbook, Momofuku and have been in an Asian inspired mood lately. 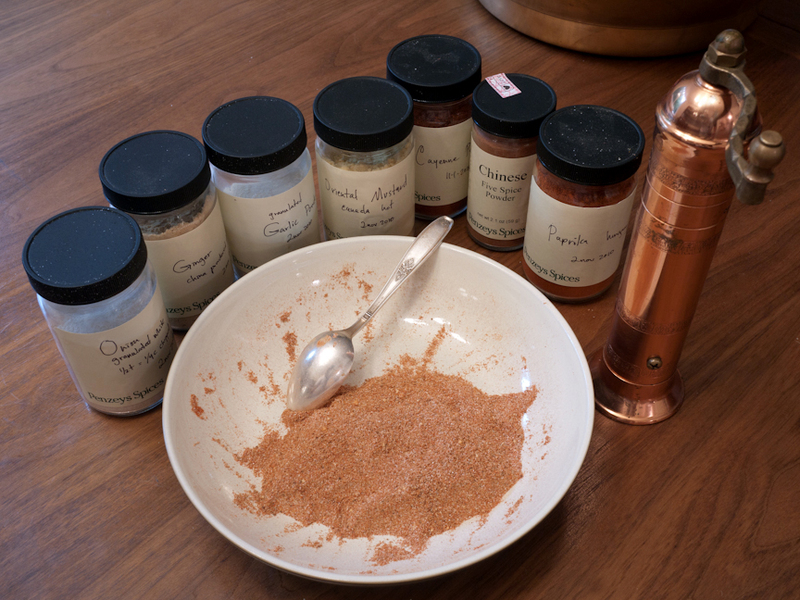 Accordingly, I used a spice rub that reflected my eastern lusts. In the rub were powdered ginger, powdered hot mustard, 5 spice, granulated onion, granulated garlic, cayenne, sweet paprika, and ground black pepper. Make sure your porcine friend is totally covered in spice, massage him good. You'll thank yourself for your benevolence later. Now, it's time for the vacuum. Vacuum sealing the meat can really intensify whatever herbs and spices you add so, keep this in mind and be careful with your flavors. This is what the package looks like after it has cooked thoroughly. Kinda ugly? I guess it's all in the eye of the beholder. Various sources say to heat your meat from anywhere between 60°C (140F) for 24 hours to 80°C (176F) for 12 hours. I decided to split the difference and go to 68°C (155F) for 24 hours. Here's the finished roast before pulling. Gotta pull your meat while it's hot! 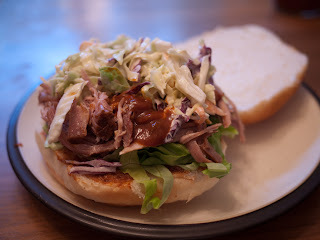 My intent was for this to go into a ramen style soup, but, it's pretty damned good on a bun too! The only thing that's missing is some smoke flavor. I rectified that by doing a little tabletop smoking with another gadget, a PolyScience Smoking Gun. That's another tale for another time. So now, that it's all said and done, my faith in sous vide is increased. Will this hurt my passion for traditional outdoor smoking? No way. I think the new technology is kind of akin to digital photography or using gps navigation. It's always better to know the traditional way but, in the end it gets you get where you want to be just the same, and without visits from the local fire department! Sous Vide is a powerful technique that produces delicious results. I am a gadget guy much to my wife's, (she enjoys her living space uncluttered), chagrin. I cannot resist trying out the newest, or the most current trend. Often I try whatever I'm into for a while and then either I lose interest and sell it, recouping as much of my investment as possible or I adopt it and incorporate into my little web of the arcane and interesting. There are frequently stacks of boxes in the "Newly Acquired" or "To Be Sold" sections of our living room floor. This year I am totally committed to healthy eating. 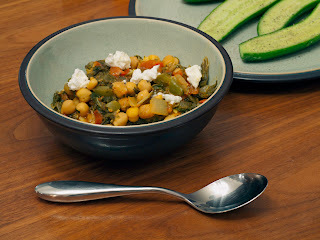 I've been reading lots of Michael Pollan, Mark Bittman, and David Kessler. 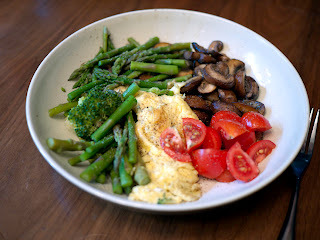 I've been eating a lot more vegetables and legumes while limiting my intake of starches and meats. If you eat a lot of vegetables, time management becomes a priority. 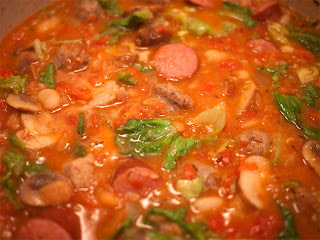 For example, you have to soak beans and then you still have to cook them for long periods of time. 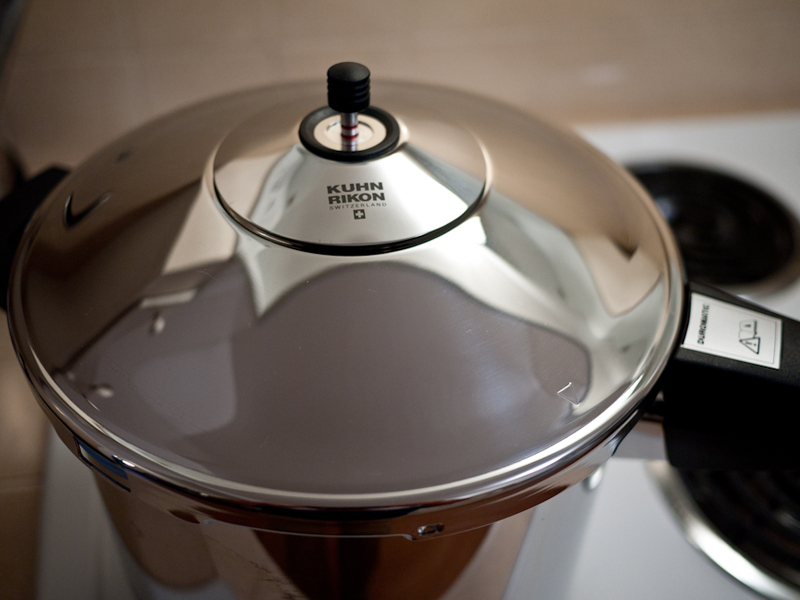 Pressure cooking solves this problem by cooking food (under pressure) in a tightly sealed chamber. I cooked up a batch of unsoaked black beans in 20 minutes. 20 minutes, start to finish! It normally takes 2 hours with beans that have been soaked overnight. 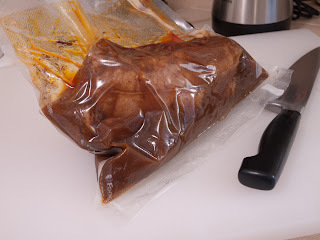 Sous vide is a technique where you vacuum seal food then cook it in a temperature controlled water bath. You can cook things perfectly and control your prep time so, meals can potentially be cooked quickly. I am going to be posting a lot of stories using both of these techniques. 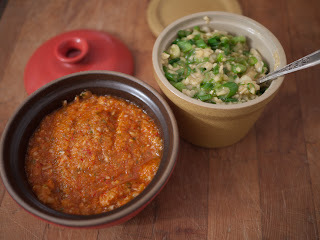 I'm finding that neither is necessarily easier than traditional cooking but, once you figure them out they can make things incredibly more convenient, and potentially healthier. I'm thinking these are both firmly in the "Keep" pile. Every year or so, I go to my local Penzey's store and refresh my stock of dried herbs and spices. This year, I picked up a jar of their hot curry powder along with all the other stuff. 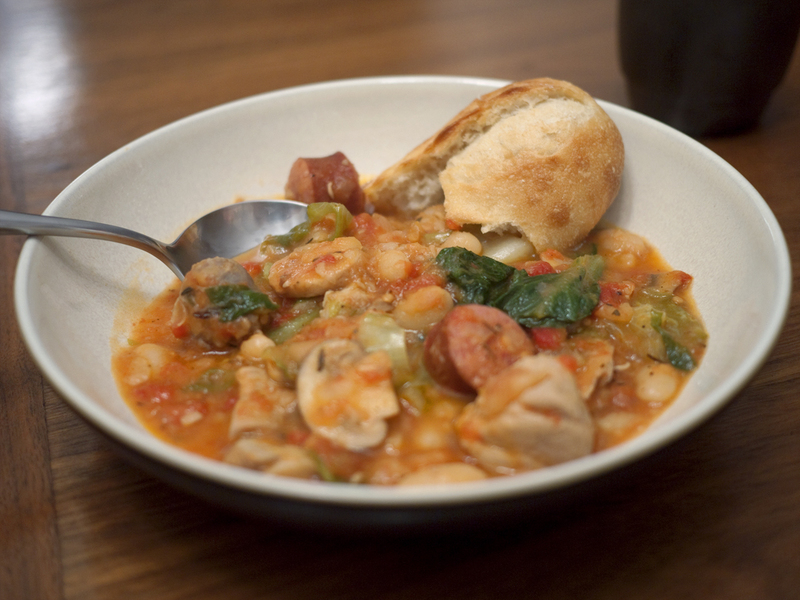 Here's a great recipe that's easy to prepare and delicious to eat. It is also completely healthy, nutritious, and filling. It's nothing more than a simple stir fry with some curry to liven things up. Once you figure out how to make this dish, you can mix and match whatever you want in the way of aromatics. It's very versatile. 20 Snow Peas, cleaned of their strings. Shell and devein the shrimp. Wash under cold water and wrap in paper towel. Heat about a tablespoon of oil, I use olive oil for almost everything I cook and this is no different. I use a wok for this but, a skillet works almost as well. 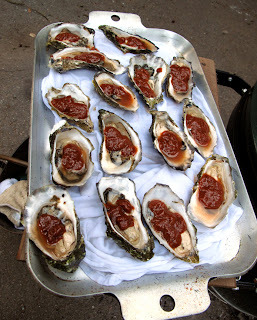 Once the oil gets hot and starts to shimmer, add the garlic and ginger. Garlic and ginger compliment and offset each other. I always try to use equal parts of each. Stir these in the oil to flavor taking care not to burn the garlic. Once the garlic develops a nice golden color throw in the shrimp and keep it going. Don't let that shrimp rest! Cook the shrimp for only two minutes. They cook quickly so, be careful. If you do let the shrimp overcook, no one will complain anyways so, it's not the end of the world. 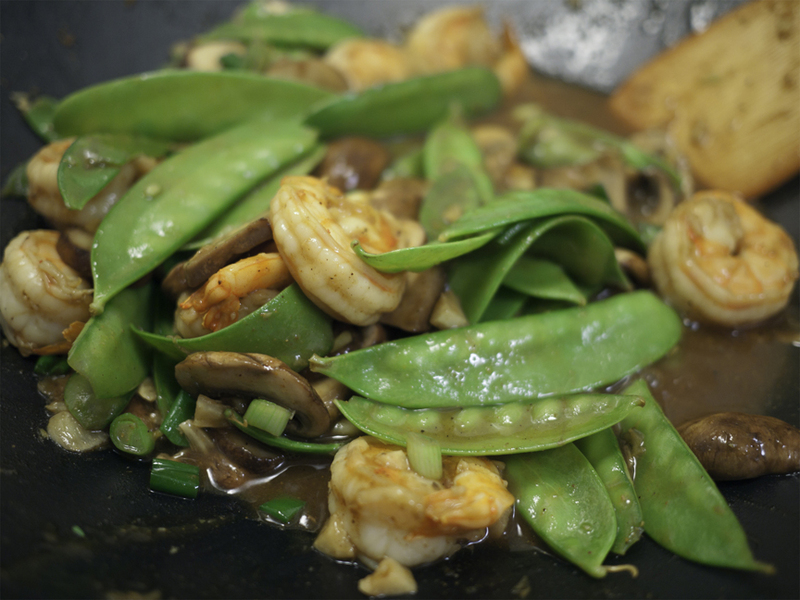 Remove the shrimp and garlic and set aside. 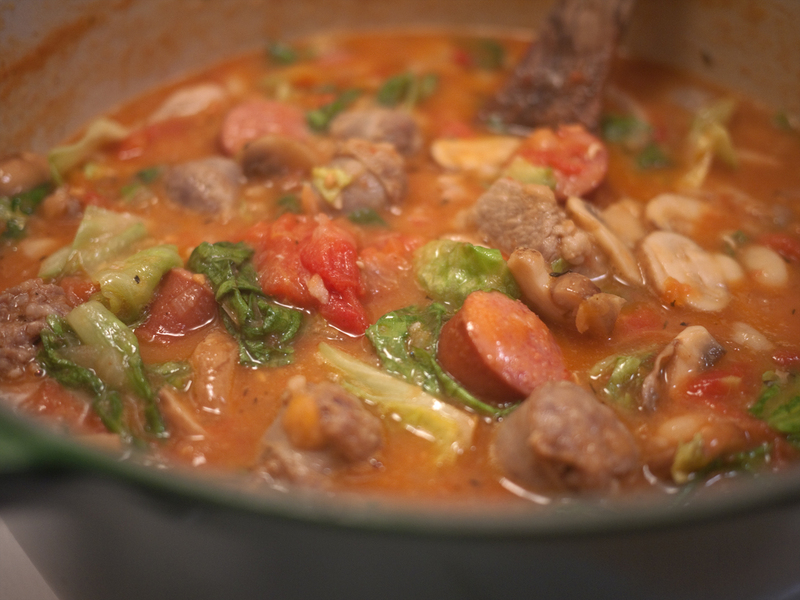 Now, add the mushrooms, peas, and chicken stock. Cover and cook about three minutes. Now add the remaining ingredients except for the cornstarch and cook for about a minute more. Add back the shrimp to the pan and mix everything together. Once everything is incorporated, add the cornstarch mixture to thicken and develop a nice glossy sheen. The whole process takes about 7 minutes. With the dawn of the new year, indeed the new decade, I am given to some self reflection and a sincere desire to better my lot in life. You know, live better, work harder, to be a more industrious, inquisitive and nicer person. I'm reminded of a passage in Mark Twain's 1872 autobiographical novel, Roughing It. Twain and his two compatriots find themselves stranded. Lost in the Nevada desert at night, under blizzard conditions. They believe their situation to be hopeless and convince themselves they will not survive the night. All three commit to oaths of contrition and voice lament about their lack of future opportunities to do good for mankind. "Brothers, let us die together. And let us go without one hard feeling towards each other. Let us forget and forgive bygones.". They each discard personal symbols of vice and moral failure, a bottle of whiskey, a deck of cards, and Twain's own tobacco pipe. When dawn breaks it is discovered that they are mere feet from a cabin and civilization whereupon they independently recover their pipe, bottle and deck of cards. Well, I vow gentle readers to do a better job with this blog! I'm also bound and determined to lose a bunch of weight and restore my physical conditioning to its former "steel spring" status. I've made a concerted effort to shift culinary gears towards eating mostly vegetables and limiting fats, sugars, carbohydrates and refined foods in general. I'm pulling out some new stops in the kitchen with the addition of a pressure cooker and an immersion circulator for conducting sous vide magic. Hopefully this year's offerings will be somewhat entertaining and informative. Hang on kids!! I think Kiwi likes the old way better. 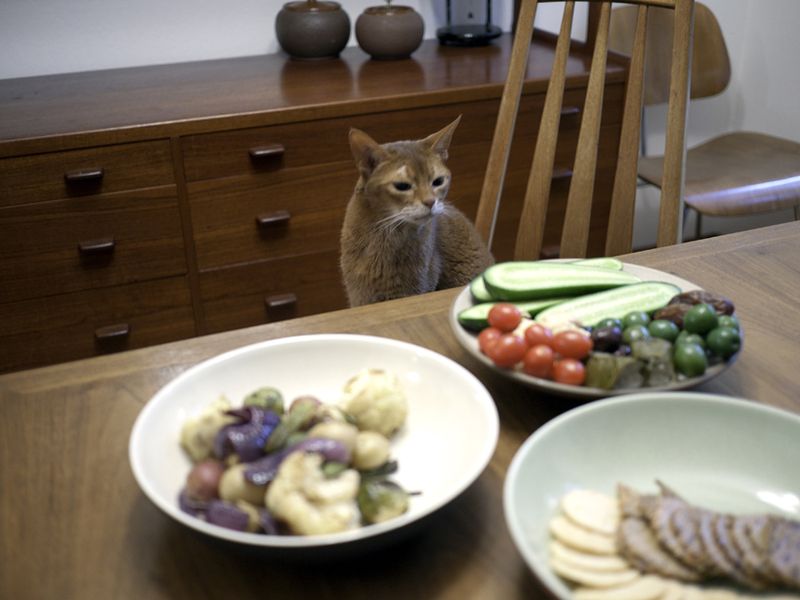 "Uhm, where's the bacon?"